Students studying a monastery Tibet has highest illiteracy rate in China: 42 percent in 2000. This is an improvement though from the past. According to the 1990 census, 72.8 percent of ethnic Tibetans over the age of 15 were illiterate. In the 1950s the figure was 95 percent. 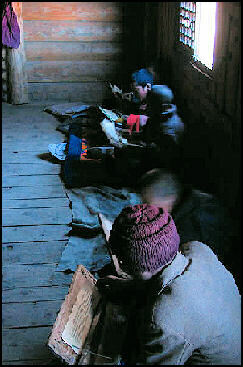 Many Tibetans are held back by a lack of education. A surprising number can’t read or write, speak Chinese or do basic math. Those that work in markets often rely on intermediaries, often Muslim Huis, to do the calculating, weighing and marketing of their products in markets. Only 78 percent of Tibetan children enter elementary school and only 35 percent enter middle school. Although even the poorest families consider education to be of utmost importance, many families can't send their children to school because schools are in short supply and children are needed for agricultural and herding chores. Poor families that value eductaion often spend what little money they have for education on one child. The others often can not read ro write. The Communist Chinese have greatly improved education in Tibet. They have built hundreds of schools. Before their arrival there were only a handful of non-religious schools on Tibet. Only a small minority received any kind of education at all. For the most part, Tibet has been closed to Western scholars and researchers. In many cases, the work of Chinese scholars has also been curtailed. Sources: Tashi Ragbey (trabgey@gwu.edu), co-founder of the non-profit Machik (http://www.machik.org/), which works with Tibetan youth on language and cultural education. You can find a wealth of information, and many more worthwhile citations, in Naomi Furnish Yamada's PhD dissertation, which is on contemporary minority education and with lots on Tibetan areas: There is a detailed account about education in Tibet written by Martina Wernsdörfer, but it is in German only: Experiment Tibet. Felder und Akteure auf dem Schachbrett der Bildung. Peter Lang. Books by scholars like Matthew Kapstein, Melvyn Goldstein, Gray Tuttle, and many others. Books and Studies: A) “Education in Tibet: Policy and Practice Since 1950" by Catriona Bass, St. Martin's Press, 1998; B) “Anthropological Field Survey on Basic Education Development in the Tibetan Nomadic Community of Maqu, Gansu, China” by Lopsang Gelek, Asian Ethnicity 7(1), February 2006; C) “Schooling Sharkhog,” by Janet Upton, Ph.D. dissertation, University of Washington, 1999, (also see other work by Janet Upton; "Education in Rural Tibet” by Gerard Postiglione, Ben Jiao and Sonam Gyatso, 2005; D) “Education and social change in China: inequality in a market economy, “ Gerard A. Postiglione, editor ; foreword by Stanley Rosen, M.E. Sharpe, 2006; E) “Choosing Between Ethnic and Chinese Citizenship: the educational trajectories of Tibetan Minority Children in Northwestern China” by Lin Yi; F) “Chinese Citizenship: Views from the Margins” by Rachel Murphy and Vanessa L. Fong (eds), Routledge. G) “Teaching and learning in Tibet: A review of research and policy publications” by Ellen Bangsbo; Nordic Institute of Asian Studies, Copenhagen: NIAS; London: Taylor & Francis 2004; H) “On the margins of Tibet: Cultural survival on the Sino-Tibetan frontier. By Ashild Kolas; Monika P Thowsen. Seattle; London: University of Washington Press, 2005; “Education as tautology: Disparities, preferential policy measures and preparatory programs in Northwest China: Naomi C.F. Yamada, University of Hawai'i at Manoa, 2012. ProQuest, UMI Dissertations Publishing. 3534561. Education has traditionally been centered in the monasteries in Tibet. Traditional monastery schools today provide religious training, teach reading, writing, math and sciences and provide training in the arts, crafts and professions. Instruction is provided by religious teachers called "dge bshe." After enteirng the school monk initiates are divided into groups and spend 10 years memorizing texts, debating a variety topics, studying, learning how to conduct ceremonies and taking exams. Oracles, mediums and exorcists receive special training. Some have suggested that boys at any age should be allowed to enter monasteries but that the monasteries have to provide a Chinese education. Tibetan families pay monasteries as little as $30 a month to teach a boy or girl Tibetan, Chinese, a little English and math. Examinations for the highest 'Lharampa Geshe' degree (a degree in Buddhist philosophy in the Geluk tradition) are held during the week-long Great Prayer Festival in Lhasa in January. “To watch them in class, though, is astonishing. No one yawns. No one dozes. Since almost no one takes notes, it's easy to think they're not paying attention. For most of the monastics, the challenges are not in the academic rigor. They see nothing astonishing about their ability to process vast amounts of information without taking notes, or to remain attentive for hours on end. Tibetan kids in a Chinese-run schoolThe Chinese have built an education system virtually from scratch in Tibet. In 1951, there were no public schools in Tibet By 1999, there were over 2000. Unlike schools outside of Tibet, elementary schools and middle schools in Tibet charge no tuition fees. High schools charge about $70 a semester, including board. The government goes through great lengths to encourage Tibetan students to stay in school. Free transportation is offered to children of nomads. Many Tibetan cities and towns have new schools with facilities that are much better than their counterparts in provincial China. The situation is different in the Tibetan countryside. In some poor rural schools, many classes are conducted standing up because there are no chairs in the classrooms. In others, children have no pencils and they sit on cement floors to save wear and tear on their desks. Teachers in these schools receive lass than $1 a month for school supplies. In some places the schools are only in session when inspectors are around. Students are discouraged from engaging in any kind of religious activity. In some schools, Tibetan children are forced to say things like "I am a Chinese citizen” and that Tibet is a land of savages and that Tibetan Buddhism is a superstition. Elementary school students are taught the importance of achieving a per capita GNP of a developed country by 2050 and told: "We must achieve the goal of modern socialist construction...We must oppose the freedom of the capitalist class, and we must be vigilant against the conspiracy to make a peaceful evolution towards imperialism." 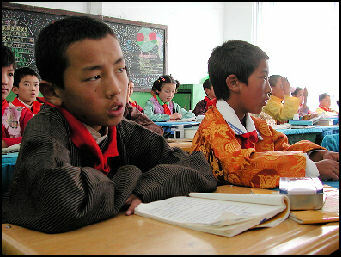 Schools in Tibet often have separate classes for Tibetan and Chinese children. This is done mainly for linguistic reasons, with the Han Chinese receiving instruction in their language and Tibetans being taught in Tibetan. Many Tibetan students take courses in Tibetan and Chinese while Chinese students take Chinese and English. Chinese is displacing Tibetan as the main teaching medium in schools despite the existence of laws aimed at preserving the languages of minorities. Young Tibetan children have most of their classes taught in Tibetan. They begin studying Chinese in the third grade. When they reach middle school, Chinese becomes the main language of instruction. An experimental high school where the classes were taught in Tibetan was closed down. Most Han Chinese teachers know little or no Tibetan. They teach their classes either in Chinese or English. At one school a Chinese principal who didn't speak one word of Tibetan told the Washington Post, "Tibetans don't have a vocabulary for science. Some science terms that are two words in Chinese, like 'electrical resistance,' when you translate then into Tibetan come up with a whole long string that you can't even write on the blackboard." Tibetan middle school and high school teachers are supposed to teach in Mandarin although many teach in Tibetan. Tibetan children in exile study in Tibetan until they are 10 so they are rooted in their culture and then switch to English. The protests spread to other towns in northwestern China, and attracted not university students but also high school students angry over plans to scrap the two language system and make Chinese the only instruction in school, London-based Free Tibet rights said. Thousands of middle school students had protested in Qinghai province's Malho Tibetan Autonomous Prefecture in anger at being forced to study in the Chinese language. About 2,000 students from four schools in the town of Chabcha in Tsolho prefecture marched to the local government building, chanting “We want freedom for the Tibetan language,” the group said. They were later turned back by police and teachers, it said. Students also protested in the town of Dawu in the Golog Tibetan prefecture. Police responded by preventing local residents from going out into the streets, it said. Local government officials in the areas denied any protests. “We have had no protests here. The students are calm here,” said an official with the Gonghe county government in Tsolho, who identified himself only by his surname Li. Local officials in China face pressure from their seniors to maintain stability and typically deny reports of unrest in their areas. The protests were sparked by education reforms in Qinghai requiring all subjects to be taught in Mandarin and all textbooks to be printed in Chinese except for Tibetan-language and English classes, Free Tibet said. “The use of Tibetan is being systematically wiped out as part of China's strategy to cement its occupation of Tibet,” Free Tibet said earlier this week. The area was the scene of violent anti-Chinese protests in March 2008 that started in Tibet's capital Lhasa and spread to nearby regions with large Tibetan populations such as Qinghai. “Tibetan language is the key to our culture, and without it all our traditions will be locked away forever,” said Abo Degecairang, 25, a ruddy-cheeked monk who is among the inaugural class of young men enrolled at the school, the Anymachen Tibetan Culture Center, which opened in September 2011 here in southeastern Qinghai Province. More striking than its improbably isolated setting is the fact that the Chinese government allowed Rinpoche Tserin Lhagyal, 48, the school’s spiritual guide and soft-spoken founder, to set up an autonomous institution dedicated to promoting Tibetan culture and language. Although Tibetan areas of China are flecked with Buddhist monasteries, their mandate is to teach religious devotion through ancient texts and long hours of prayer. Nonreligious schooling is typically controlled by the state, most often anchored in Mandarin, although poverty and geographic isolation deprive many children of any formal education. It was those young people whom the Rinpoche---a title bestowed on high-ranking teachers in Tibetan Buddhism---has sought out, eager to give them a future that he hopes will help preserve their heritage. “If your heart is in the right place, everything else will fall into place,” said the Rinpoche, who raised more than $3 million to build the vermilion-painted building topped by shimmering gold roofs. The main building, which dominates a breathtakingly picturesque valley, also houses an ornate temple filled with colorful Buddhas and altars illuminated by butter lamps. The school is so far off the grid that it must rely on solar power. Those who now call the center home have seen their world profoundly altered. Some, like Tuzansanzhi, 19, a shy youth dressed in monks’ robes who, like many Tibetans, uses a single name, had never been to school before. “I’m an only child, and my parents needed me to care for our sheep,” he said in Tibetan, the only language he knows. Before he arrived in July, Tuzansanzhi was illiterate. Now, he sits at a desk writing a Tibetan script that is crisply uniform. Rather than be deterred by the tense relationship between the Communist Party and Tibetan people, the Rinpoche spent years cultivating “guanxi,” or personal relationships, with Qinghai officials. Through those efforts he methodically obtained approvals from numerous government departments. The government, he says, hopes the center, which he says will eventually house 600 students, will attract tourism and raise local living standards. To raise money, the Rinpoche traveled across China seeking donations, and received them largely from Han Chinese, who make up 80 percent of his 1,000 contributors. “Han people give me money for the same reason Tibetans donate: they want to do good,” he said. Many donors---most of them newly affluent Han---say they view Tibetan Buddhism as an antidote to the materialism and greed that have flourished alongside China’s breakneck development. Zhu Chuanhong, 35, a banker in the southern city of Guangzhou, says she was deeply inspired after meeting the Rinpoche at a dinner party there last year. “I was so moved by his love, mercy, devotion, selflessness and determination,” she said in a telephone interview. Soon afterward she traveled to the center and handed over more than $15,000 for a well and a passenger van. Friends of hers contributed money for the center’s cafeteria and religious statuary. “That money can buy a lot more, do a lot more and mean a lot more in Qinghai than in Guangzhou,” she said. In addition to his fund-raising quest, the Rinpoche traveled to poor villages and orphanages across Qinghai in search of those young people most in need of an education. While room and board for each student costs only $2.50 a day, teaching is more expensive. He said it cost $1,000 a month to employ an artisan from Tibet to teach the students how to paint thangkas, the intricately vibrant scrolls that depict Buddhist religious scenes. The Rinpoche hopes to enroll girls too, but given religious norms that forbid monks from mixing with women, that means building another dorm and a suite of classrooms. In the old days, the larger monasteries acted like universities. They contained individual colleges devoted to specific subjects and they had their own facilities and administration. Regionalism was very strong. Monk-students from the same regions were assigned to he same residence halls. Each college was headed by an abbot, or khenpo. A geshe degree, the highest rank in the Geluk school of Tibetan Buddhism, is the Tibetan Buddhist equivalent of a Ph.D. The Dalai Lama has one. Geshe graduates are expected to be well versed in the 320 volume of the Tibetan Buddhist canon. Usually monks have to study for 20 years before being allowed to take the exam to earn it. The gap between the knowledge of teacher in Tibet and those outside Tibet is growing, with those outside of Tibet knowing more. In recent years geshe degrees have been awarded outside of Tibet but not in it. In June 2005, a final examination for a geshe degree was held ay Jokhang temple in Lhasa for the first time in 16 years. The Beijing-based Buddhist Association of China conducted the test in the form of a question and answer debate. Six monks in their 70s passed the test. Conventional universities are Chinese-run. Students at the University of Lhasa face expulsion if they pray at temples or take part in religious activities. They complain they are taught not to believe in religion because religion and socialism are incompatible. Many of the students at Tibet University are Chinese studying for development jobs in Tibet. University students in Germany can major in Tibetology. The science program "was sort of like a culture shock for me," said Choegyal, who is based at a monastery in southern India. While Tibetan Buddhism puts a high value on skepticism, conclusions are reached through philosophical analysis — not through clinical research and reams of scientific data. So it was difficult, at first, for many of the students. And the questions ranged across science and philosophy: Are bacteria sentient beings? How does science know that brain chemistry affects emotions? Are Tibetan beliefs in mysticism provable through science? After five years, Choegyal says he has managed to hold onto his core beliefs while delving deeply into science. "Buddhism basically talks about truth, or reality, and science really supports that," he said. Questions that science cannot address, like the belief in reincarnation, he brushes aside as "subtle issues." Instead, he mostly finds echoes across the two cultures. He points to karma, the ancient Buddhist belief in a cycle of cause and effect, and how it plays into reincarnation. Then he points to the similarities with evolutionary theory. "Everything evolves, or it changes," he said, whether in evolution or in reincarnation. "So it's pretty similar, except some sort of reasoning."